Located close to the tip of Minnesota’s Arrowhead, the Naniboujou Lodge is one of the many treasures the North Shore calls its own. It is most recognized by the iconic paintings found in the canoe-shaped dining room ceiling, which has been referred to by many as the North Shore’s Sistine Chapel. It was painted by Antoine Goufee, a French artist, with Cree Indian designs (the word Naniboujou is Cree for “God of the Outdoors”) that cover the walls and ceiling and transport guests to another world. Beginning in 1929, the lodge was a sportsmen club that was characterized as an ultra-exclusive private club. 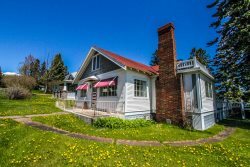 Charter members included Babe Ruth, Jack Dempsey, and Ring Lardner, It’s no surprise why so many high-class members gathered here, as the lodge is located on the beautiful North Shore of Lake Superior and has lived up to its expectations from its first day of business. Back in its early years, the Naniboujou Lodge was struggling to make ends meet following the stock market crash in the 1930’s. It was quickly foreclosed on despite just being opened. Since then, the lodge has revitalized and now serves as one of the most recognized restaurants on the North Shore. The lodge is home to Minnesota’s largest native rock fireplace, a beautiful 200-ton piece of art located in the dining room. Listed on the National Register of Historic Places, we highly recommend visiting Naniboujou Lodge and exploring all of the wonderful things nearby. Whether it’s hiking or fishing the Brule River, located right next to the Lodge, or even just strolling the beaches that lie on the property, no time spent there will be a waste. From Grand Marais, take Highway 61 northeast for approximately 14 miles. Naniboujou will be on the right side of the road (or the same side as Lake Superior) just after Judge C.R. Magney State Park.